In a sense, the D&D game has no rules, only rule suggestions. No rule is inviolate, particularly if a new or altered rule will encourage creativity and imagination. ...And, it's why I love B/X Dungeons & Dragons - it's easy to alter or create a rule without causing massive structural flaws in the system. YES!!! 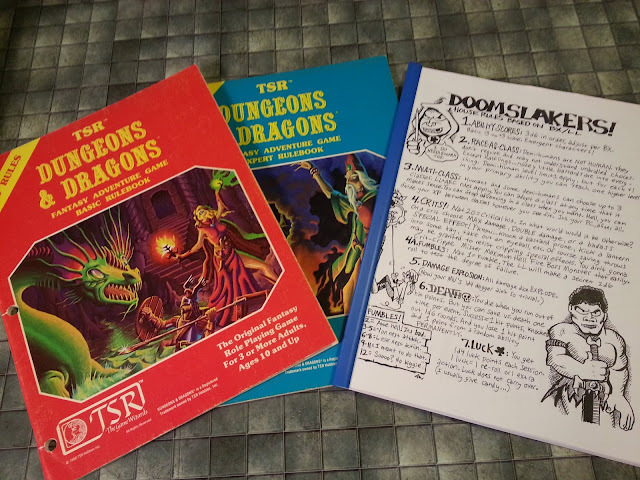 I recall looking down my nose at B/X many times back in the early 80s while I flipped through the pages of my AD&D hardbacks. It took decades to realize that I was actually PLAYING B/X the whole time. At least as far as how or game rolled. It was far more B/X than it ever was AD&D. My new game is a slightly modded version of B/X and I couldn't be happier.